With 15,000 kilometres of coastline, New Zealand is a beach-lover’s paradise. From family-friendly swimming spots to wild and rugged stretches of coastline, check out some of New Zealand’s best beaches below. In 2017, the TripAdvisor Travellers’ Choice Awards named Mount Maunganui Main Beach the best beach in New Zealand for the third year in a row. 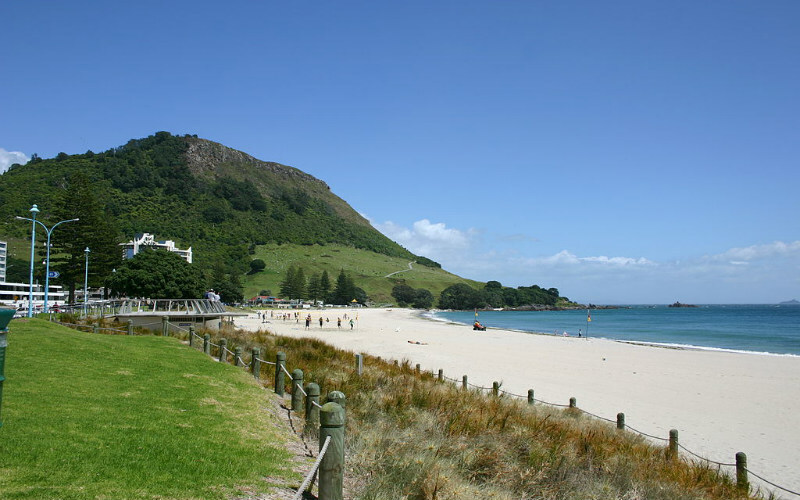 It’s easy to see why this beach is so popular; with soft white sand and thundering surf just below the green peak of Mount Maunganui, this beach is an idyllic setting for any occasion. Plus, with water temperatures rising above 20 degrees in summer, there are few better places to swim, surf, socialise and sunbathe in New Zealand. Surrounded by cafes, fishing spots, walking tracks and scenic lookouts, this bustling summer retreat will charm even the most reluctant of beachgoers. Mount Maunganui Main Beach, Tauranga, New Zealand. Image Credit: Robert Engberg / CC by 2.0. Welcome to the wild west of New Zealand. Piha Beach is a formidable surf beach situated about an hour west of Auckland. Famous for its treacherous swells, this popular beach was featured on TV screens around the world from 2001–2017 in the reality show, Piha Rescue. 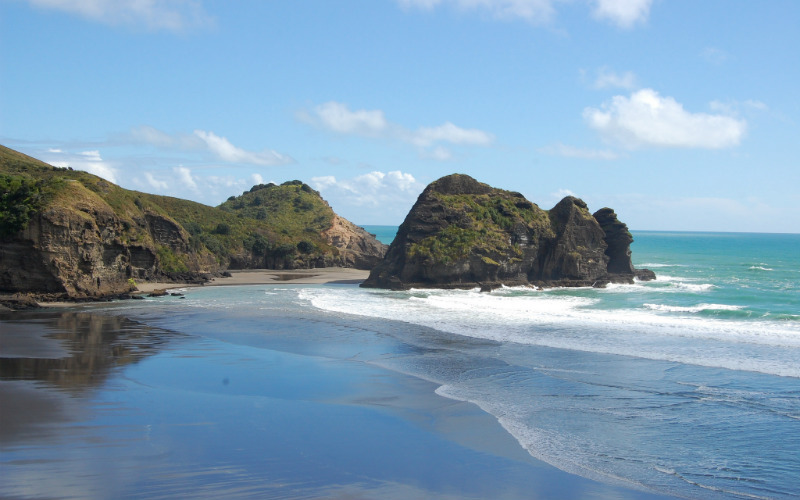 Notoriety aside, Piha Beach is simply a beautiful place to visit. Let its waves churn around your ankles, leave footprints in its wet, black sand, and scramble up the rugged face of Lion Rock for panoramic views of the dramatic coastline. Piha Beach, Piha, New Zealand. Image Credit: MickiTakesPictures / CC by ND 2.0. 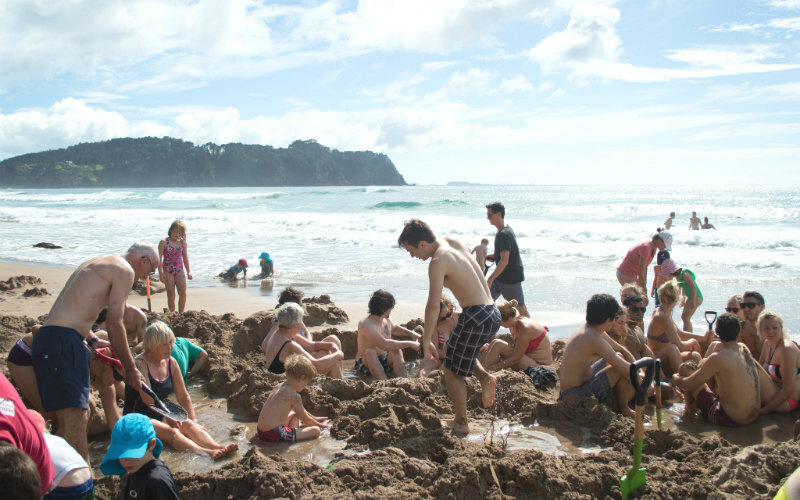 When it comes to unique experiences, Hot Water Beach on the Coromandel Peninsula is a tough contender to beat. At high tide, Hot Water Beach paints a typically pretty portrait of blue water, craggy headlands, and the faint silhouettes of distant islands. However, those who wait for the falling tide will be able to discover thermal water bubbling just beneath the sand. Grab a spade and head to Hot Water Beach at low tide to dig your own heated pool just metres from the Pacific Ocean. Whether you build yourself a custom-sized bath or simply soak in the product of someone else’s efforts, these steaming-hot sand spas are an experience you can’t afford to miss. Hot Water Beach, The_Coromandel, New Zealand. Image Credit: David Schmitz / CC by 2.0. Just west of Cape Farewell, the northernmost point of the South Island, Wharariki Beach is perfect for those who like their beaches wild, rugged, and astoundingly photogenic. 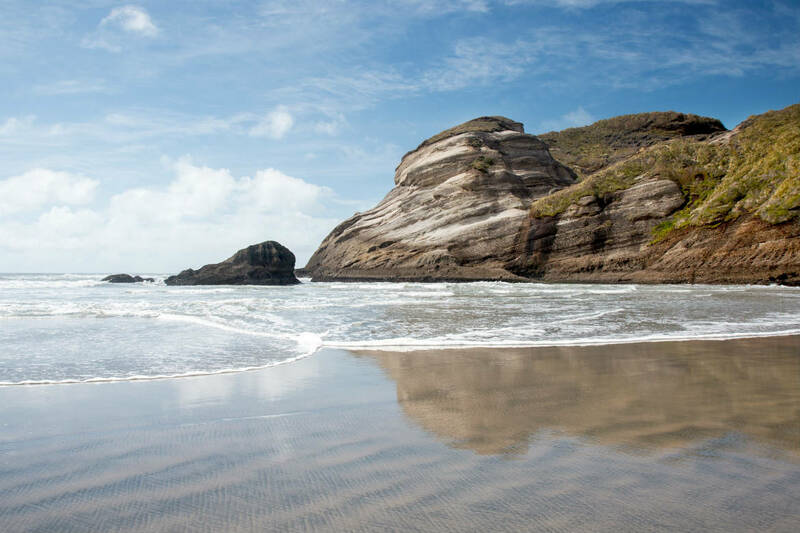 Wharariki Beach can only be reached after a 20-minute walk through farmland and coastal forest, and this feeling of remoteness is certainly part of its appeal. Wharariki’s windswept coastline is characterised by big cliffs, big sand dunes, big caves and, of course, big waves. 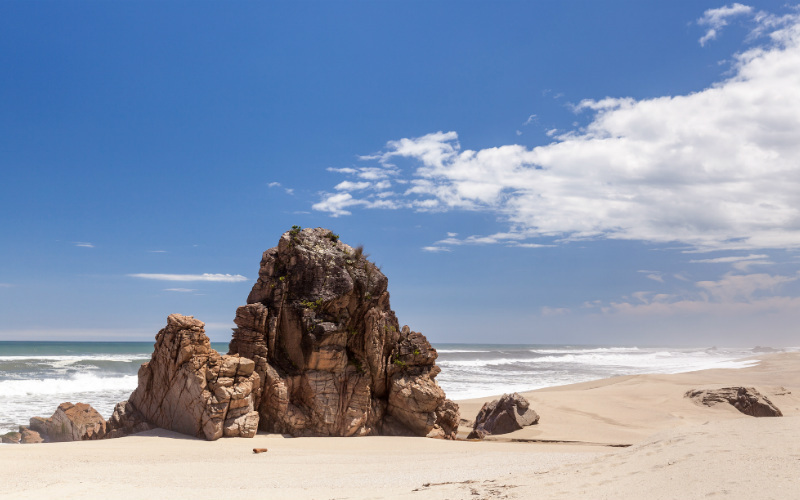 Take one look at the ocean-battered rocks and you’ll quickly realise that this beach isn’t known for its swimming opportunities. Instead, wait for low tide and marvel at the massive sand dunes, rock formations and caverns—and perhaps even the odd seal—as you trek across the glassy, rippled sands of Wharariki Beach. Wharariki Beach, Puponga, New Zealand. Image Credit: Graeme Churchard / CC by 2.0. About an hour’s drive along the coast from Nelson, Kaiteriteri Beach has long been one of the region’s favourite swimming and camping destinations. Boasting golden sand, clear, aqua-tinged water, and the most sunshine hours you can find in New Zealand, CNN has named Kaiteriteri Beach one of the world’s 100 best beaches. 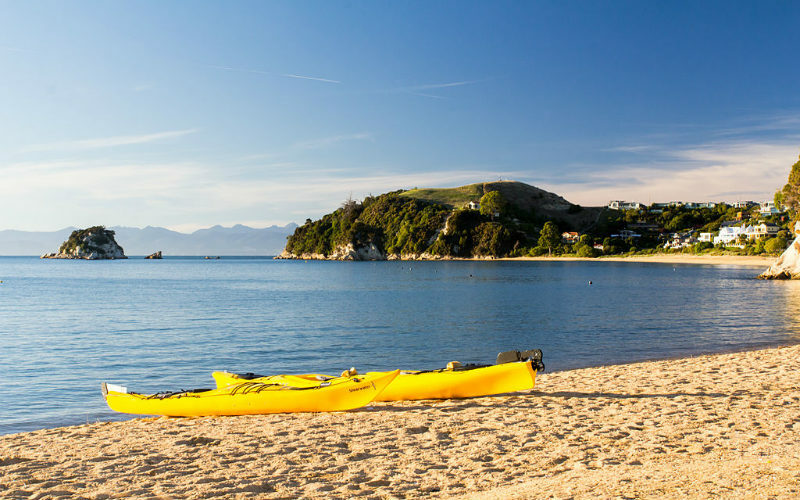 Paddle (or paddleboard) in the warm shallows of Kaiteriteri Beach, hunt for scallops and mussels by the rocks, or jump into the lagoon from the bridge at high tide. This popular summer retreat is also a gateway to Abel Tasman National Park, where rivers, native birds and flowers, bushlands, and marble outcrops present a whole new list of sightseeing opportunities. Kaiteriteri Beach, Kaiteriteri, New Zealand. Image Credit: Oren Rozen / CC by SA 3.0. First off, it should be made clear that Ninety Mile Beach is not 90 miles long. 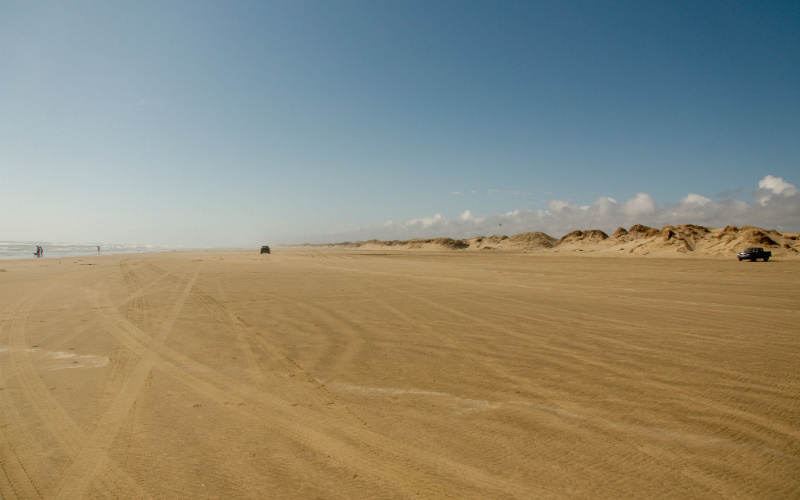 But once you get over the fact that it only stretches for a paltry 88 kilometres, Ninety Mile Beach is sure to win you over. This beach runs along the northern tip of the North Island between Kaitaia and Cape Reinga, the spiritual northern point of New Zealand. With sandy expanses and water as far as the eye can see, Ninety Mile Beach is a phenomenal place to catch a sunset. Take off your shoes and make tracks along the empty beach, or hike up its desert-like dunes to glide your way back down on a sandboard. Ninety Mile Beach, Northland, New Zealand. Image Credit: Andy Rogers / CC by SA 2.0. Situated along the Heaphy Track, Scotts Beach is one of the most scenic highlights of this 80-kilometre walk. It takes almost an hour to walk from Kohaihai to Scotts Beach, but the scenery here makes it all worthwhile. 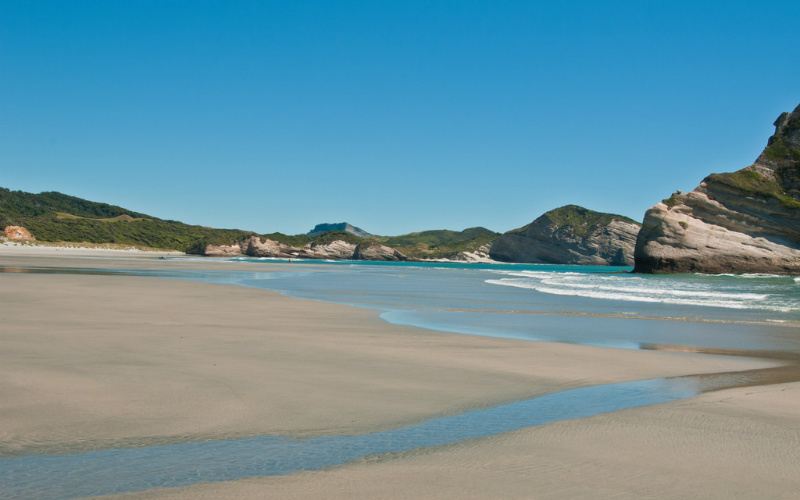 Often misty, usually deserted, this narrow stretch of pristine sand is backed by the forested mountains and cliffs of Kahurangi National Park. Nikau palm trees, rocks and driftwood lend this beach a wild, tropical atmosphere, and the restless waves—though too dangerous for swimming—will clear your mind off any other noise. Scotts Beach, Karamea, New Zealand. Image Credit: russellstreet / CC by SA 2.0. Ready to go beach-hopping across New Zealand? Find flights to these incredible destinations, hotels and more with Webjet! Feature Image Credit: Andrea Schaffer / CC by 2.0.